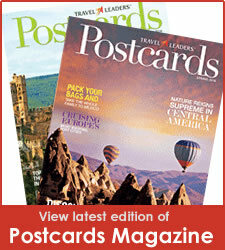 Postcards magazine, published four times a year by Travel Leaders, is for people who love to travel. Postcards specializes in providing inspiration for vacation plans through feature articles on a wide variety of dream vacation destinations—from the well-known to off-the-beaten path. The magazine also has regular features that include a city spotlight, great hotels to stay at around the world, and other entertaining destinations features, including a look at unusual festivals and local events. Postcards also contains Travel Leaders exclusive offers through its extensive network of destination and supplier partners including cruises, luxury travel, air travel, hotels, resorts, destinations from the Caribbean to Australia and Europe/Mediterranean to Alaska. The magazine showcases the breadth and depth of Travel Leaders’ travel experts.